Recently I have become aware of PlantTracker which has been set up by the Environment Agency, the Nature Locator team at Bristol University and the Centre for Ecology and Hydrology. They are asking for help from the public to track down non-native species that are a threat to our native wildlife. It is well known how species such as Rhododendron ponticum, Fallopia japonica (Japanese Knotweed) and Crassula helmsii (New Zealand Pigmyweed) have become unwelcome aliens in our Country. There is a website and an app for use on smartphones to help locate the plants. The results are already proving to be of help to them and to the BSBI in identifying key risk sites for further invasion problems. I well remember the excitement back in the 1970s that the late Dr Francis Rose showed when he first found Crassula helmsii in a small pond adjacent to Hatchet Pond in the New Forest. His excitement was caused by the fact that his initial identification of it was Elatine hydropiper, a very rare species that he had never seen before. Further research however put him right, and the truth was that he had had his first encounter with a most unpleasant alien. It did not take long for the whole of the bottom of that pond to be a one species carpet of Crassula helmsii with some important species crowded out completely. 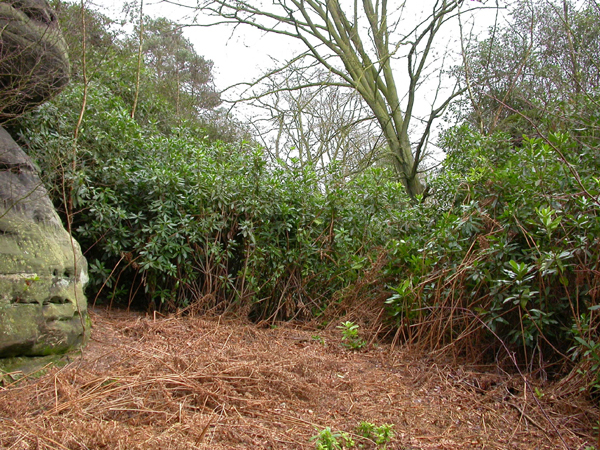 The first occurrence of Crassula helmsii in the New Forest was recorded by the late and very able, deaf botanist Paul Bowman. His notebook showed that having found Crassula helmsii nearby, he then drove to Hatchet Pond. Circumstantial evidence suggests very strongly that a small piece of the plant may well have attached itself to his boot. This shows just what an invasive threat this species must be. The original source of the invasion is thought to have been an aquarist supply shop in Essex. 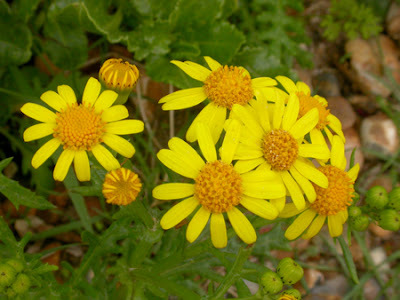 The story of Oxford Ragwort Senecio squalidus is fascinating. This species is now ubiquitous on the tops of walls and throughout Britain’s railway system. It is now completely taken for granted as part of the British flora. It is called Oxford Ragwort because it was grown in Oxford Botanic Gardens in the late 17th century having been collected from volcanic cinders on the slopes of Mount Etna. It was a small hop from its flower bed in Oxford to the walls of the Botanic Garden from whence it found the walls in the rest of the City and, from 1844, the cinders on the early railway tracks passing through the town. In no time at all, it had established itself throughout Britain on its fast expanding railway network. Another species Canadian Pondweed, Elodea canadensis was a terrible invasive menace in the past, but now seems to have settled itself relatively comfortably into the ecology of aquatic habitats. One of the great problems with invasive species is that they have no predators, species that feed on them or diseases that keep them in check in their new home. The very attractive bug Graphocephala fennahi was introduced into Britain in the 1930s from America. This species feed on rhododendron, and it appears possible that it also spreads a fungus that attacks it. Japanese Knotweed seems to be a species that is extremely difficult to eradicate, and once established creates a habitat that is devoid of pretty well all other species of wildlife. It creates such a dense cover that other photosynthetic organisms cannot establish themselves beneath it. As everyone knows, unwanted, and invasive aliens are not restricted to the plant world. 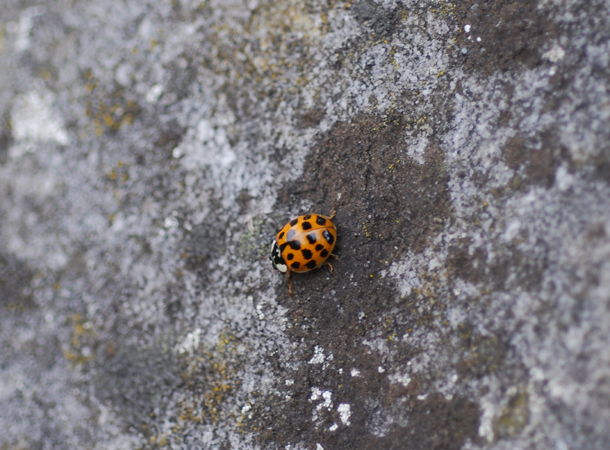 Grey squirrels, mink and more recently harlequin ladybirds are all species that have had a savage effect on our native fauna. It is interesting that bluebells are rather rare in Europe, and the wonderful and ebullient spectacle of the British bluebell wood does not exist there. The reason for this is that wild boar are native in Europe, and control bluebells by digging them up, and eating them. Is it possible that bluebells became an invasive species when the wild boar finally became extinct in Britain? Is it possible that this acknowledged aspect of our wildlife heritage will be threatened by wild boar becoming once more established here? Interestingly Cyclamen hederifolium with its English name Sowbread has not become invasive in our woodlands although it is grown extensively, and does very well as a garden plant. Where established, it can provide a fine spring show on hedge banks. In Europe, woodland can be “ploughed” by wild boar seeking the corms of wild cyclamen. There has been encouragement from conservationists to provide wildlife corridors to encourage the spread of wildlife. Unfortunately it is the aggressive, non native aliens that benefit from most habitat corridors. 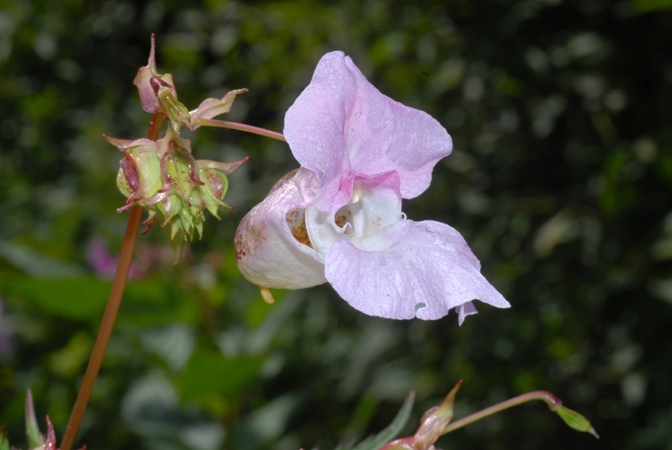 One only has to see the spread of Impatiens glandulifera Himalayan Balsam throughout our river and canal system to see how beneficial wildlife corridors can be to alien species. The same is true of our railway system and the spread of Oxford Ragwort. Most native species such as dormice, bats and badgers do not spread their range along wildlife corridors although some may use corridors such as hedgerows to find forage. It would be wonderful if otters were able to return to our river system as rapidly as mink did and it is heartening to see how many have returned already. A much better way to encourage an increase in native wildlife is to increase the acreage of our best, existing wildlife habitats. As mentioned in my first blog, many of the lichens that are used for estimating the age and ecological continuity of woodland are probably dispersed in the digestive systems of molluscs. In the New Forest, Burley Old Inclosure which was newly planted around 1700 has developed both as habitat and in its lichen flora to compare favourably with neighbouring native, ancient and ornamental woodland. Discouraging the spread of aliens using non-native biological control may be fraught with difficulty. There are examples of non-native predators becoming a greater threat than the species they were designed to control. Where successful, such control may be very effective, but extreme caution is required before such biological control is implemented. Most conservationists shy away from the use of chemical control, however it seems that chemical methods are about the only armament available for the control of Japanese Knotweed. Invasive species are not confined to land, they can also cause havoc in marine habitat around our coast. The slipper limpet is a case in point as is Japweed Sargassum muticum which became established on the Isle of Wight in the early 1970s. It has now spread throughout western Britain as far north as south western Scotland, and is established in Ireland. In Britain, its long strands grow to the exclusion of all native marine algae where it has become established. Control of this menace was started too late for it to be very effective. Finally, the question of whether a species is native or introduced can be fraught with difficulty. While the date in which most became established can be easily found, there can be arguments for the native status of species that are universally thought of as being introduced. 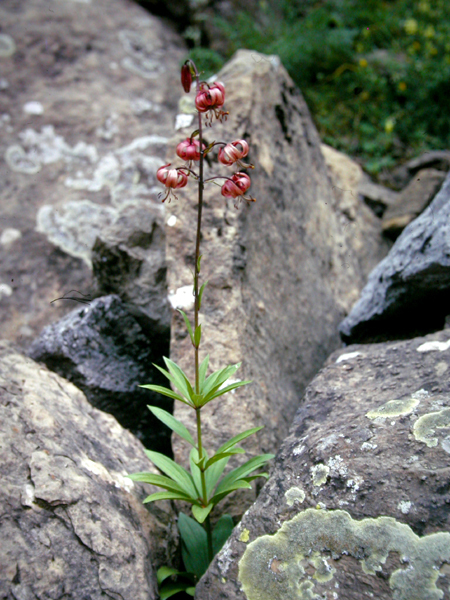 Of native species, smooth snake has some doubt cast upon its native status while the late Dr Francis Rose argued strongly that there was a case for the Martagon Lily Lilium martagon being native.